THE EXPLOSIVE NEW NOVEL FROM THE INTERNATIONAL BESTSELLING AUTHOR - IF YOU LIKED AND THEN THERE WERE NONE, THE ABC MURDERS, AND NORDIC NOIR, YOU'LL LOVE THIS . 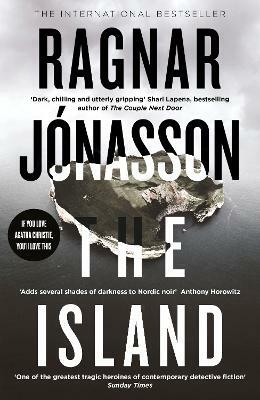 . .
Detective Inspector Hulda Hermannsdottir is sent to the isolated island of Ellidaey to investigate and soon finds haunting similarities with a previous case - a young woman found murdered ten years ago in the equally desolate Westfjords. Haunting, suspenseful and as chilling as an Icelandic winter, The Island follows one woman's journey to find the truth hidden in the darkest shadows, and shine a light on her own dark past. Ragnar is an author who takes his readers to some of the coldest and most isolated places on earth. The tiny town in Iceland where the snow can cut off any outside communication?